Control Running Programs is a new application by the developer of fsLock that serves two purposes: The first purpose is to prevent that more than the defined instances of a program are executed on a system while the second starts an application whenever it is closed on a system. I think that both functions need some explaining,it took me a while to figure out what they are exactly good for. Instance Controlling, that's the official name of the first function prevents that more than x instances of a program are running on a system. If another instance of a program is started that exceeds the defined value that instance will be closed immediately. This can be extremely useful if you are working with applications that spawn other applications from time to time. I was not able to come up with an application yet that has such a behavior, maybe Internet Explorer. An interesting aspect is that you can only pick an application that you want to add from the list of running processes which means that the application has to be running to be added to the list. 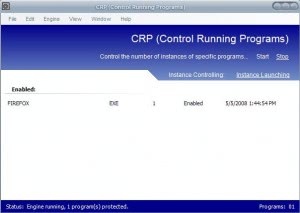 The number of instances that can be run simultaneously is not limited. Another possible use for this function would be if you happen to start programs multiple times from time to time. The second function might prove to be better suited for a lot of users. It is a list of applications that the user wants to run all the time on his computer. It scans the processes constantly and if it detects that a process has been terminated that is in the list it will restart the application. 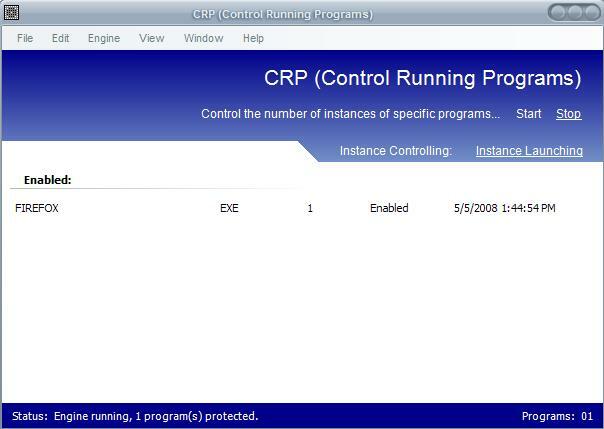 Control Running Programs requires the .net framework 2.0 or higher but does not seem to have any other limitations.